Some may say my friend Frank is a dinosaur because he owns a bookstore in Inman Park. Yes, a bookstore. You’re probably thinking he may as well sell buggy whips, beepers, or inkwells, and that it’s a marvel his store didn’t die on the side of the information superhighway. But December 1 marks twenty-five years since he opened his store, called A Cappella, and I take Frank’s survival as testimony that the world is not such a suckwad of wasted potential after all. Because I miss books. And I don’t mean that in a misanthropic, get-off-my-lawn way, as in, “Boohoo, books are digital now, and I can’t flip through their pages.” I mean I miss the necessity of having to read them to get the knowledge I need. I miss the quest. I miss knowledge being a reward, as opposed to a bunch of instant options on a Google impulse. For example, I now know what Abraham Lincoln’s skull looks like—I mean his actual skull. There is a display at the National Museum of Health and Medicine in Silver Spring, Maryland, with actual fragments of Lincoln’s skull that were collected during the autopsy. I have never been to Silver Spring, and I didn’t have to go. All I had to do was look up the images on the Internet, and now that knowledge—what President Lincoln’s skull looks like—is inside my own skull. I don’t even know if I want it there, but it’s knowledge that deserves some respect, right? It deserves to have been earned, but instead it’s out there for the unwashed masses like me to conjure with a click while I procrastinate on a deadline. I miss books. In my twenties, I moved with my mother to Zurich, Switzerland, for two years. It was before the great, global cultural pasteurization of rampant Wi-Fi. There were two hours on a Wednesday each week when a British news channel played old American sitcoms—Green Acres, I Dream of Jeannie, Bewitched, and Petticoat Junction—and that was all the television I got unless I learned German. So I picked up some books and learned German; I had to. Also, the bookstores there had literally one shelf devoted to English-language books. There was no software instantly updating the Swiss book buyers on the day’s New York Times bestseller list, no Fifty Shades of Grey wads of canine-Kotex books to choose from. They sold the English classics and that’s it: P.G. Wodehouse, Evelyn Waugh, Isak Dinesen, T.S. Eliot, Samuel Butler, etc. I remember buying Out of Africa. I loved it so much that I was elated when I saw that the author had died the year after I was born, because it meant that, for a brief time, the two of us had actually shared the earth together. See? I took what was offered. I appreciated what was offered. I used to work for the airlines, and part of the company perks was that I could designate annual buddy passes to my friends. These passes were good for anywhere the airline flew in the world—thousands of choices. Often, I’d notice that some of these passes simply expired, never having been used. I asked my friends why, and the answer was always the same: They couldn’t make up their minds on where to go. Thousands of choices, and they made none. They were inert in the face of vast selection, and I get it. It’s like the Internet. It’s too much. Too many choices to know which is the right choice, so instead of selecting something—instead of taking action—you do nothing. Let’s say I want to establish a fact—a truth—of some kind. The worst place to go is the Internet, yet that is where everyone goes. In the early nineties, I worked for Creative Loafing as an investigative reporter. I got up at 4 a.m. to perform school bus surveillance. I went to the library to look things up. I saw with my own eyes and heard with my own ears before I established a truth. The truth was a thing. It existed. If we wanted to know it, we sought it out. It was a quest, not a click. And then when we found it, we wrote about it—in depth, not in a post. And if readers wanted to learn it, they read about it—in depth, not in a series of unconnected, completely subjective two-line tags on a Google search results page. I miss the truth, and books are where we find it. It’s not just the feel of books or the nostalgia of them; I hate that argument. 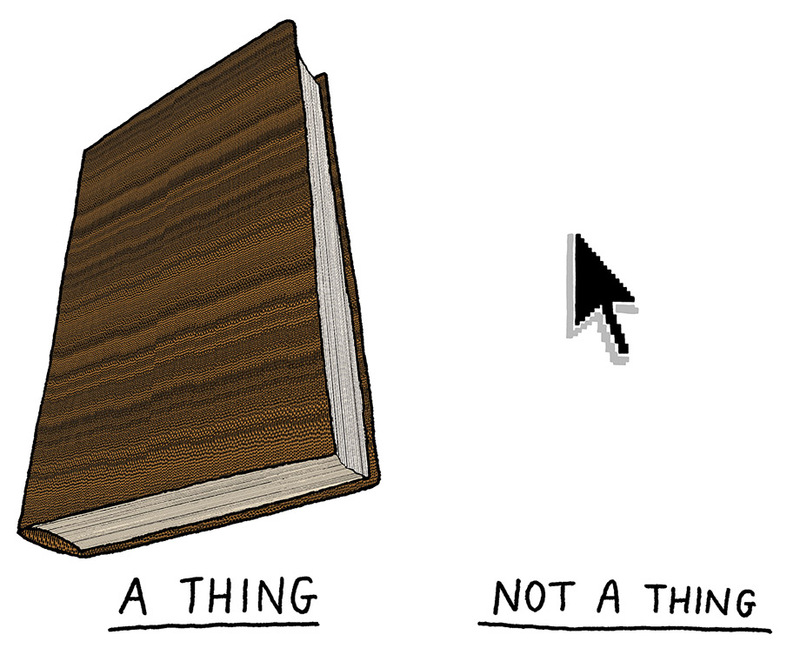 It’s that books are a finite thing. They are not fluid like a website or digital download. You can’t go back and unprint them, screw around with the facts, cover up truths to make someone look better, or rewrite passages as an afterthought. A book is there. It’s printed. It’s in your hand. It’s a thing. This article originally appeared in our November 2014 issue.